This is nice! Worth a try. At last I can implement my Cricket-Scores-Bot without having to deal with a XMPP client :) Still need to scrape someone! 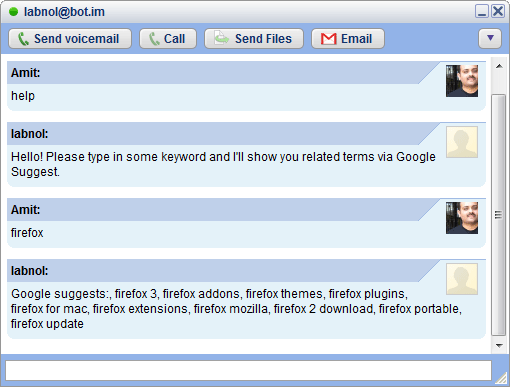 For this example, I have created a dummy bot called “labnol” that listens to your IM messages and return related search phrases based on Google Suggest. To see this live, add labnol@bot.im to your GTalk buddy list and start chatting. Step 3. Now it’s time to create a bot which is actually a simple script that resides on your public web server. It could be in PHP, Perl, Python or any other language. More here. Now login to your imified account, paste the script URL and add that im bot your friends list. That’s it.